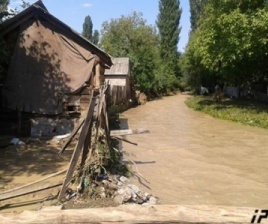 TBILISI, DFWatch–A hundred houses were flooded in a small Georgian village Tuesday night. Due to heavy and long rain, villages were flooded in an area near Khashuri in the central parts of Georgia. The flood hit hardest in Kvishkheti, which lies in the mountains. Rain flooded the river Shola close to the village and the bridge over the river was damaged. The muddy water flowed into the ground floors of about a hundred houses, and also damaged several roads. According to locals, the water level is about one meter inside their houses. Cattle houses collapsed, poultry died and harvest was destroyed. Emergency crews are helping to drain the water.